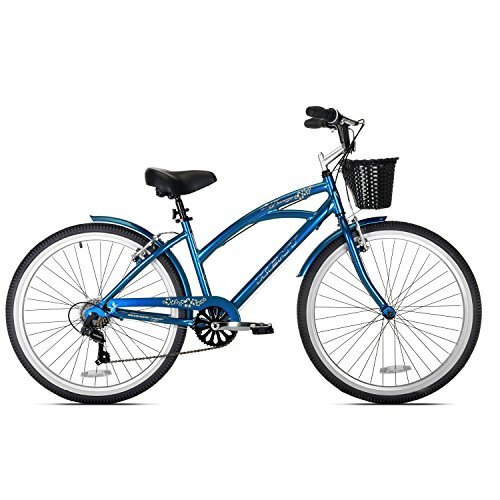 The 26" Kent Bay Breeze 7-Speed Cruiser Bike combines classic design with modern functionality. 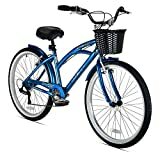 With a sturdy, lightweight aluminum frame, the Bay Breeze Cruiser will never let you down while riding on different surfaces, including paved or unpaved roads, paths, or trails. Besides its stylish looks, this 26" Kent beach cruiser also features excellent linear pull brakes, a comfort saddle, twist-grip shifting and a rear rack for your things! The adjustable saddle height gives you a perfect fit. Finished in a glossy blue paint, this bike will look good for years to come.